While a lot of the sound we hear travels to our ears through the air, we actually hear a great deal through vibrations in bone. When a person with normal hearing hears their own voice, most of what they hear comes through vibrations. This mechanism is called bone conduction. That’s why you sound funny when you hear yourself played back on a video; you’re not used to hearing your own voice through air conduction. A perfect example of bone conduction hearing is scratching your head! YOU can hear it… but no one else. Problems in your outer or middle ear can block the flow of sound waves, preventing them from getting through to your inner ear. 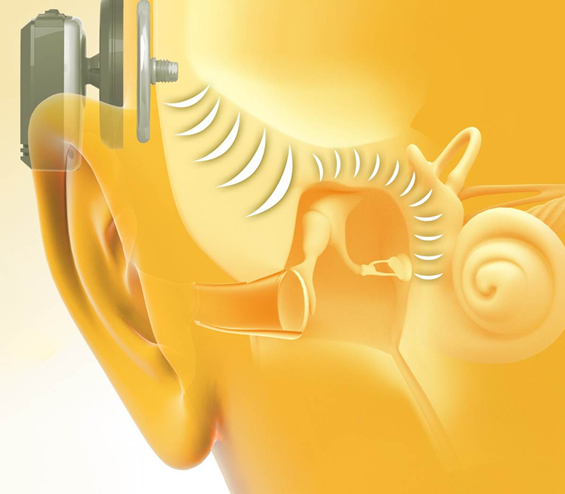 A conventional in-the-ear hearing aid relies on forcing enough sound through these problem areas, whereas the Baha System uses the body’s natural ability to send sound through bone conduction.